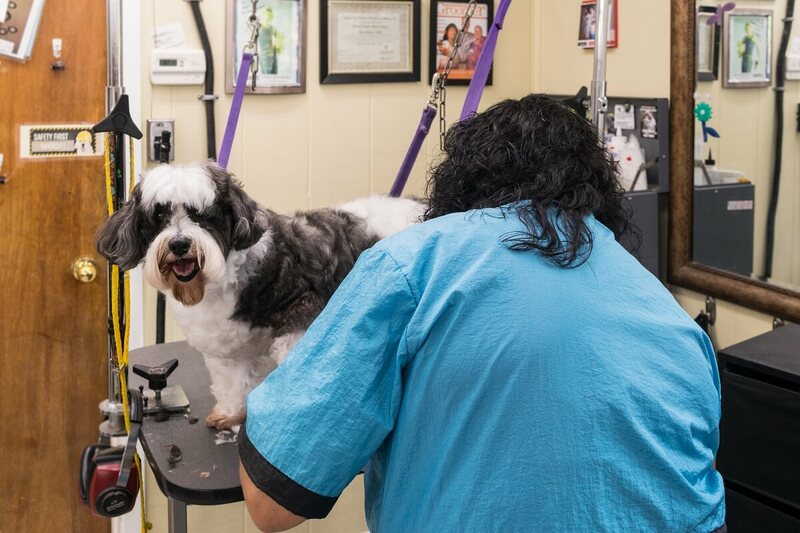 Through our coursework and pledge to the AKC Grooming Safety Oath, we are commited to the health, safety, and well-being of the pets entrusted to our care. All pets are cared for in a humane and compassionate manner. We do not use sedation or chemical dips. Our pet stylists are more than happy to spend extra time and attention on your aged or debilitated pet. Please let us know ahead of time so we can plan for the extra time. Finishing with a bow or bandana. Need a bow to match wedding colors or a bandana for a seasonal party? Just let one of our stylists know! Specialized shampoos are available, or bring in the shampoo that your veterinarian has recommended. Maria Swancara has been with Kenl Inn since 1992 and has performed every job in the house! She decided to get creative and started her adventure in grooming. It was a long process to get certified in all breeds of dogs but Maria has always pushed forward and strived to learn more and more! The National Dog Groomers Association of America Inc. has presented Maria with a National Certified Non-Sporting Groomer Certificate. She has also received the NDGAA National Certified Master Groomer Certificate. To continue growing and improving her skills and the skills of those around her, Maria goes to Hershey, PA for one of the largest grooming shows/seminars in the country every year to expand her knowledge of styles and products. She is always looking for new things to bring to Kenl Inn such as doggie bling, feathers and airbrush tattoos. 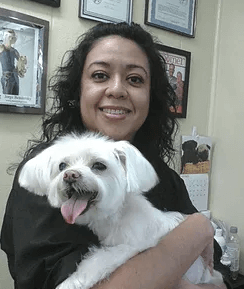 Maria teaches classes such as Basics of Grooming and Maintaining Coats Between Grooming through Southeast Community College to help aspiring groomers as well as dog owners on how to keep up with their pet's style and health. Bonus: Maria speaks English, Spanish and American Sign Language. We use a Nourish Vitamin Conditioner in all three spa treatments that uses a cocktail of white ginger, botanical moisturizers, and vanilla that repairs pet’s dry damaged hair. All three spa treatments include a nail trim and filing. The comfort spa soothes and calms your pet with lavender and oatmeal aroma-therapy along with lavender verbena comfort cologne. This package includes a hydrating Fresh Facial Scrub that removes dirt and tear stains with a refreshing blend of vanilla and blueberry. The renew bath leaves the hair shiny, as well as clarifies and removes toxins with ginger root and pink grapefruit. This is the best of the best. The ultimate spa includes the special shampoo, cologne, Fresh Facial Scrub, and a nail and paw treatment. The nail and paw treatment uses vanilla & milk thistle and vitamin enriched bath oils to sooth their paws. The science behind micro bubbles revolutionizes skin cleansing. Due to the size and ionic charge, micro bubbles can deep clean skin, hair follicles, and pores without the aid of surfactants, detergents or soap. There is no risk of skin sensitivity issues or allergic reaction. Virtually eliminate pet hair from your home. Our trained Hair-Buster technicians follow a multi-step treatment plan to remove shedding hair, nourish the skin, and apply an anti-shedding solution. Kenl Inn proudly offers our Suds-A-Pup self-wash, equipped with HydroSurge bathing equipment and high velocity dryer. The self-wash works similar to a car wash. Come by and try it and leave the smell and mess for us to clean up! After using the Suds-A-Pup you’ll never go back to your bathroom tub. Note: Apron, towel, shampoo and brush/comb included for your use.